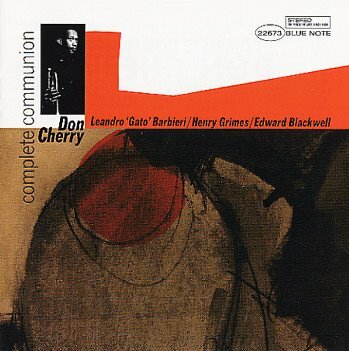 'Complete Communion' was Don Cherry's debut as leader for the Blue Note label, at a time when the company was expanding it's avant-garde roster (which was to eventually include such luminaries as Ornette Coleman and Cecil Taylor). He had co-led a session for Atlantic in 1961 with John Coltrane ('The Avant-Garde') but this was his first time in the spotlight. Cherry had already made a name for himself as an integral component in Ornette Coleman's group alongside Charlie Haden on bass and Ed Blackwell (also featured here) on drums. Cherry's own music at this early stage of his career was a direct outgrowth of his work with Coleman. Although his style was still rooted in hard-bop, on this record he inhabits a totally different harmonic territory to contemporary mainstream jazz. To the ear the themes often seem odd, passages seem dissonant, or totally out of place. But everything is tightly structured. You can hear this in the playing of Cherry and Barbieri. They often take lines together - not quite in unison but acting as a sort of contrast to each other and ultimately being quite melodic, despite the dissonance. This is backed up by superb bass playing from Grimes - his solos show him to be both a melodic and percussive player. Blackwell reprises his role with Coleman with a strong performance that swings as often as it inhabits regions of polyrhthymic complexity. Cherry would go on to record a further two albums for Blue Note - 'Symphony for Improvisers' and 'Where Is Brooklyn' in 1966, both pushing back the boundaries of rhythm and harmony well beyond what's heard on his Blue Note debut. To the uninitiated, that makes 'Complete Communion' a better record to start with; it's closer adherence to standard bop based structures and it's sense of swing make it more accessible. Take the time to have a read at this article on Cherry that explores the many facets of this wonderful musician. I would love to hear this one!